Pokémon Let's Go Pikachu and Let's Go Eevee for the Nintendo Switch is sweet. It's adorable. And if you go into it expecting Baby's First Pokémon Adventure, it'll knee you in the kidneys. In fact, maybe Pokémon Let's Go is best compared to a Pokémon itself. Specifically, a Litten. Go ahead and give it cuddles, but don't underestimate it unless you want to walk away with your ankles shredded to bloody ribbons. This man is not afraid to use his whip on your tenderest regions. That's not to say Pokémon Let's Go is an overly-difficult adventure, but it's more "Pokémon" than "Pokémon Go," and some fans might be taken off-guard. As news was published about the game's seemingly stripped-down battle system, we admittedly shrugged and said, "What do you expect from a Pokémon game that does away with random encounters? What do you expect from a Pokémon game that asks you to just throw PokéBalls at wild Pokémon without whittling down their health?" 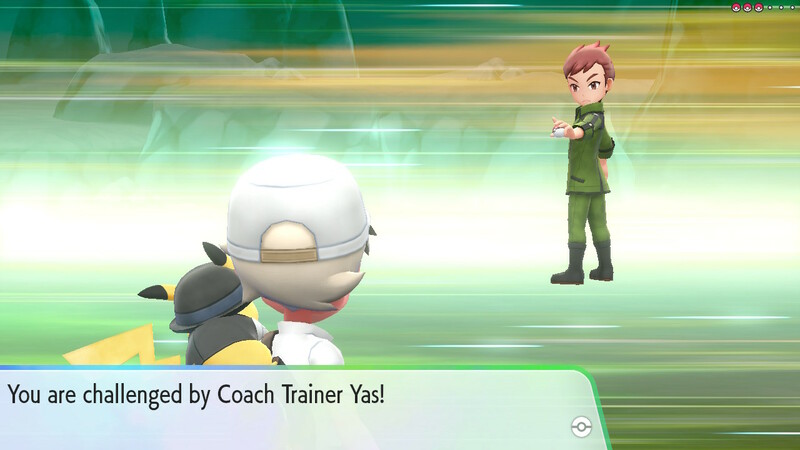 "Coach Trainers" like Captain Yasss over here are scattered throughout Kanto, and they'll give you a good workout. If you win, the rewards are rich. 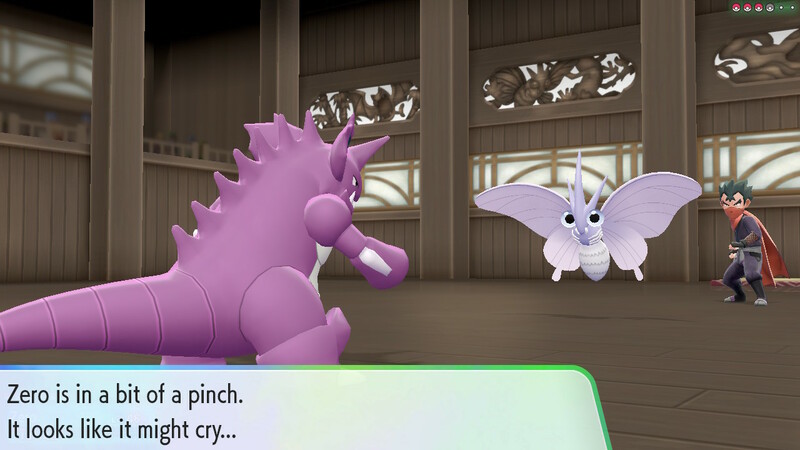 It's natural to be mistrustful of Pokémon Let's Go. It's a funny-looking game at first glance; seemingly more like a glorified app than a full experience. Though your quest to parade around Kanto and become a Pokémon Master is unchanged from 1996's Pokémon Red and Blue (your avatar and your rival are all-new characters, however), you don't get into random scuffles by wading through tall grass. Instead, Pokémon spawn in the reeds and amble around. You can avoid them entirely, though be prepared for some of them to wander away from their spawning point and directly into your path. 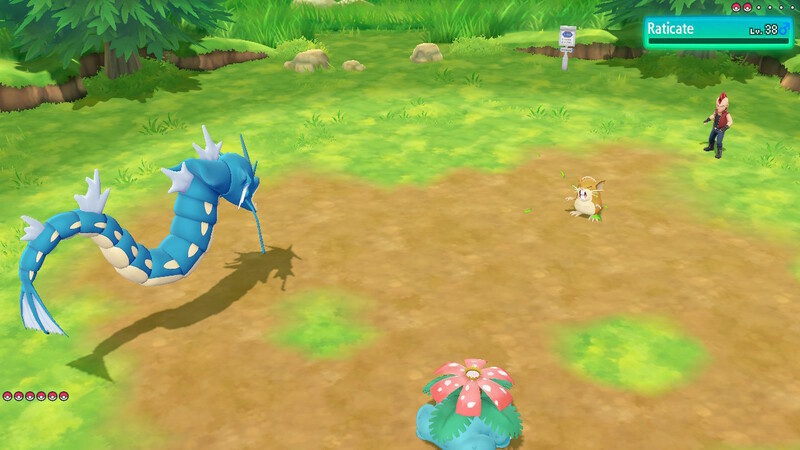 The elimination of random encounters is one oddity in Pokémon Let's Go, but engaging in a "battle" with a wild Pokémon is even stranger. There's no struggle to weaken the Pokémon with the help of your tamed crew. Instead, you proceed directly to the PokéBall-lobbing portion of the process. Tired: Struggles for supremacy against wild Pokemon. Wired: Dodgeball!!! Better-quality balls (snicker now, get it over with) result in easier catches. Some Pokémon jump or fly around, so moving your Joy-Cons can help you line up a better shot. You can also move your Switch around if you're playing in handheld mode. When you're ready to throw down, execute a throwing motion with your Joy-Con or PokéBall accessory to make the shot, or press "A" if you prefer. Hold your breath while the ensnared Pokémon wiggles back and forth. Exhale in relief or bark a curse according to the outcome of the hunt. If things don't go your way and you need to try again, consider using a Razz Berry to calm down your quarry and make it easier to catch. 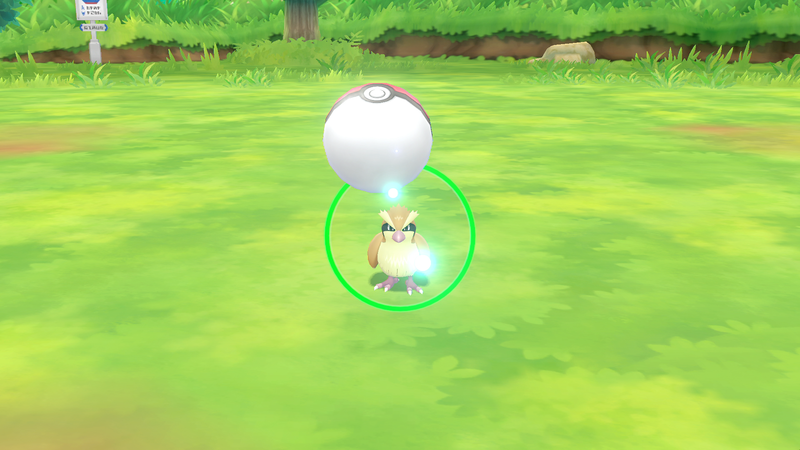 It's probably clear, but capturing wild Pokémon in Pokémon Let's Go is where the "Go" portion of the game comes in. It's also probably the most controversial change in this HD retread of Pokémon Red and Blue. 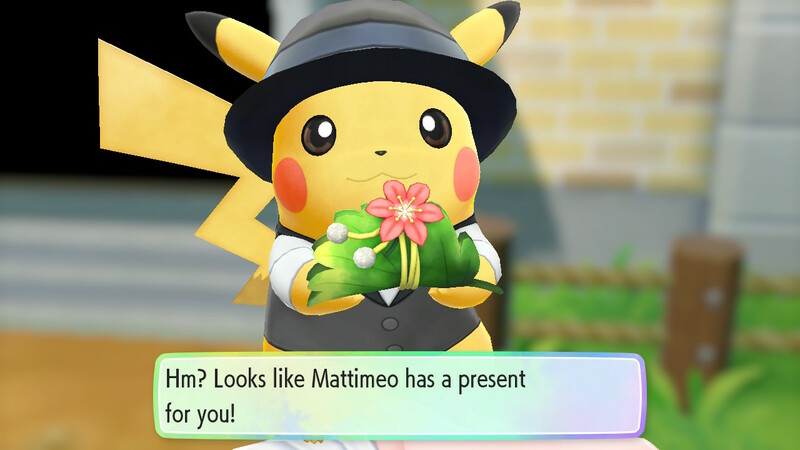 Implementing Pokémon Go connectivity into Pokémon Let's Go is fine. It's a great idea, even, given the popularity of Niantic's Pokémon-catching game / app. But there isn't much skill in throwing PokéBalls at a Spearow and hoping luck favors you. Whittling down a rare Pokémon to a sliver of life before snagging it is an experience that defines Pokémon. The thrill of a careful hunt is woven into the series' DNA, and Pokémon Let's Go's method of catching Pokémon cheapens that hunt. But I'm a filthy hypocrite because I admit Pokémon Let's Go's one-step method of grabbing wild Pokémon makes grinding for levels a breeze—and there are more than enough rival trainers to lock eyes with, so Pokémon Let's Go never leaves you aching for a fight. What's more, you can send extra Pokémon to the Professor for "research" (Oak is behind the mulching machine this time instead of Willow) and to earn candies. Candies give your Pokémon's sagging stats a boost, which is a great option if you don't necessarily want to spend ages hunting for a friend with perfect stats. I'm conflicted about Pokémon Let's Go's method of wild Pokémon-wrangling, but it has its benefits. I'm also a new and steadfast fan of random Pokémon encounters disappearing from the series like so many Abra, as the sight of Pokémon frolicking through the grass makes this imaginative and lively franchise feel even livelier. One possible reason Game Freak did away with wild Pokémon battles in Pokémon Let's Go is because local co-op is a significant selling point for the game. A couch-buddy can drop in and out of your Pokémon adventure, and if you have the coordination, you can catch Pokémon as a pair. Teaming up to throw capsules at a Pokémon is admittedly a better team activity than trying to execute a menu-based battle together. Options for your co-op pal are limited: you share a Pokémon roster, and I couldn't find any option to edit your partner avatar's looks or outfit. Still, going two-on-one against a tough foe is fun, and it's a great idea for younger and / or inexperienced players. If Pokémon Let's Go deserves to be labelled "Baby's First Pokémon Game" because it lets kids play with their parents while the latter travel through Kanto again, so be it. Though it can use more fleshing-out, it's a great feature. Bringing in a pal to take down a tough Pokemon is a bit like summoning an older sibling to help deal with a neighborhood bully. Any player in any age group will be happy to travel through the fields, cities, and seas of Pokémon Let's Go. Kanto is as charming as ever, even though the terrain's not as dynamic as the mountains, deserts, and volcanoes we see in later games. The HD Pokémon models are bright, clean, and to scale (just in case you need a visual reminder of how terrifyingly huge Electrode is). The size difference between the Pokémon makes fights a little more fun, though some of the Pokémon's animations are a let-down. No physical contact occurs between the beasties, and too many moves are "animated" by having the Pokémon hop up and down. Whatever Game Freak has planned for Gen VIII, I hope the battle animations finally move beyond Pokémon Stadium territory. 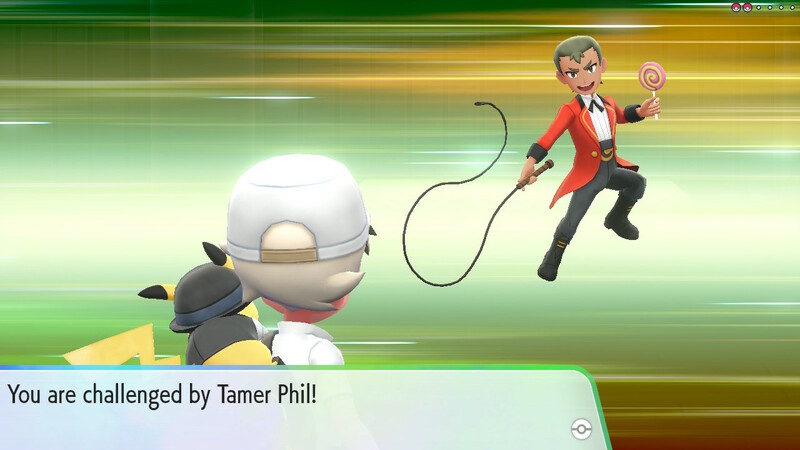 Fortunately, the movements and behaviors of the partner Pokémon who follow behind you (or run in front of you) make up for Pokémon Let's Go's sometimes-stiff battle animations. I'm honestly impressed at how much work Game Freak put into each critter's body language, and Pikachu and Eevee are just too cute when they roost on your shoulder. I want to eat 'em up. There are also adorable touches Game Freak programmed into the game even though there's a good chance you'll never see all of them. When I entered Pewter City's museum, I just happened to have a Nidoran following behind me. My Nidoran made its way to the museum's Moon Stone display and stared at it, entranced. Though I already knew Nidoran requires a Moon Stone to reach its final evolution later in the game, newcomers to the series get a chance to wonder at the link between the two. It's a very subtle, very cute way of weaving an explanation of Pokémon Let's Go's mechanics into the game's environment. Though I kicked off this review by stating Pokémon Let's Go is "more Pokémon than Pokémon Go," Niantic's dizzyingly popular Pokémon collecting game assuredly has a direct presence in Pokémon Let's Go. When you reach Fuchsia City in southern Kanto, you find the Pokémon Go Park where Red and Blue's Safari Zone used to be. After you link your Pokémon Go account with your Switch (go into Pokémon Go's Settings and look for the option to connect; don't sit like an idiot and expect the connection to happen by magic, like I did), you can pluck your Gen One Pokémon from Go (Alolan forms, too!) and plop them into one of Let's Go's many "Parks." When you visit a Park, you can catch the Pokémon roaming there and add it to your Kanto team. There's also an option to play a mini-game with the Pokémon you bring over to Let's Go, though you need 25 of the same Pokémon to play. I couldn't play, since I routinely grind my extra Go Pokémon into Candy. Hey, storage in Pokémon Go ain't free. 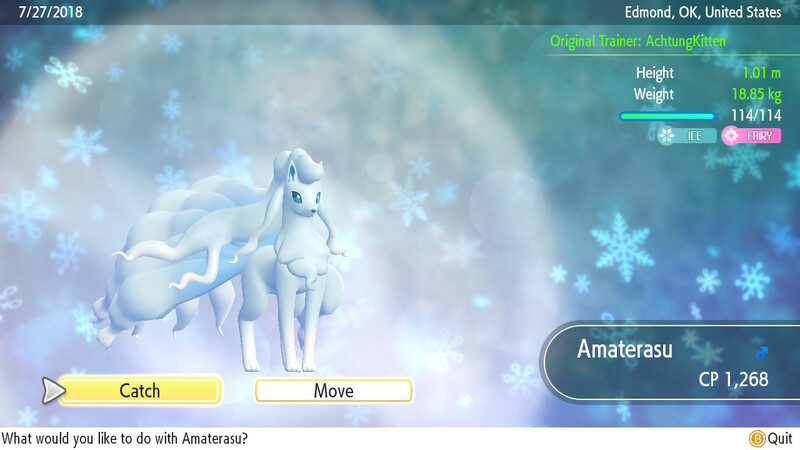 Pokémon Let's Go's option to import critters from your Go roster is an easy way to complete your PokéDex without trading. 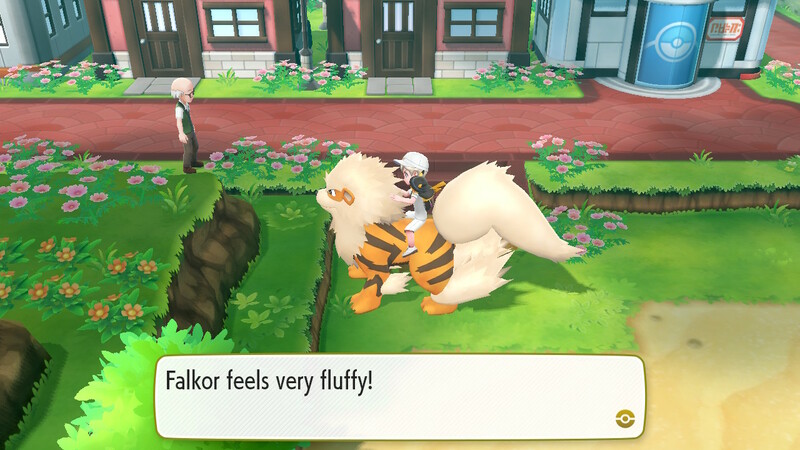 Does the agony of choosing Growlithe (in Let's Go Pikachu) or Vulpix (in Let's Go Eevee) keep you up at night? Now you don't have to sweat it! As an adorable little girl said in an El Paso commercial, "Why don't we have both?" Oh, hey! Welcome to Kanto!...Yeeeeah, it's pleasantly warm here year-round, corner-to-corner. You're probably going to hate it. Sorry. Beware, though. Once a Pokémon is evicted from Go to live in Let's Go, they can't be returned to Go. Also, when you re-capture a Pokémon Go denizen in Let's Go, its history in the mobile game is erased. The imported Pokémon's level, combat power (CP), and moveset is changed. Even its name is erased, though you can re-apply the name whenever you like. In other words, don't export your champion Machamp from Pokémon Go and expect a murder machine to visit Kanto. You need to train your exchange student back up to glory. If you want instant power from your diasporic Pokémon, a traditional trade might still be your best bet. If you want to build up an outsider, though (or if you just want a low-effort way to fill out your PokéDex), bringing it over from Pokémon Go is a good option. Just be aware of the consequences. Though I never regarded Pokémon Let's Go's preview material with any disdain, I admittedly didn't think too hard about the game, either. I always intended to try it, but I entered Kanto expecting a casual experience for very young children. Several hours later, I was as captive as a Kakuna sealed in an Ultra Ball. Damn right. Only the floofiest Arcanines are allowed in my presence. I'm still unsure about Pokémon Let's Go's newfangled way of capturing wild Pokémon, and I'm going to be heartbroken if Gen VIII's Pokémon animation doesn't exit N64 territory. Otherwise, Pokémon Let's Go is a great remake of an RPG classic, and it wouldn't hurt my feelings to see Johto, Sinnoh, or Unova get the Let's Go treatment. Tagged with Adventure,	Game Freak,	Niantic,	Nintendo Switch,	Reviews,	Role Playing Games,	Switch.